Light through Stained-Glass Windows: Is the spirit a bird? Pentecost week songs are coming fast and furious. Here's part of "Pulsing Spirit" by Benedictine Delores Dufner of Minnesota. flood the world with life and light." Noisy daytime hours at the Mount this week. Landscapers are giving our gardens their annual clean up and clear out. 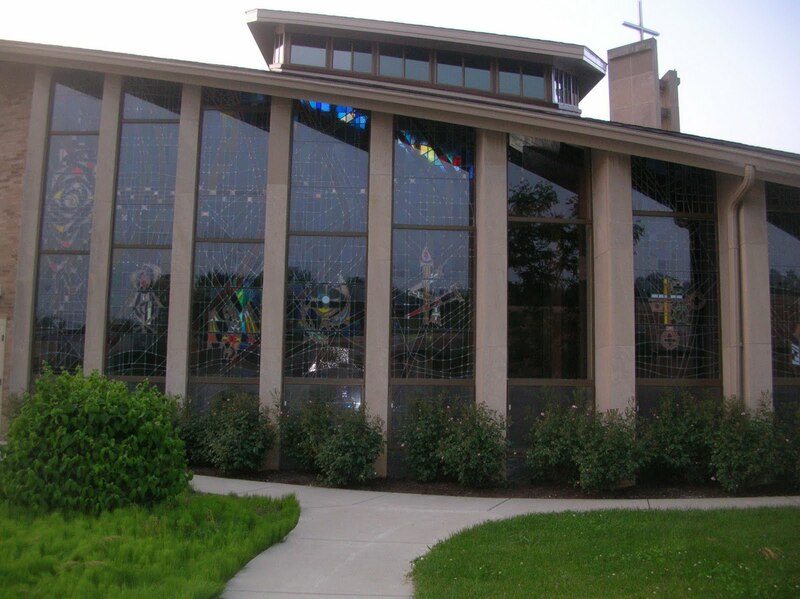 And, workers are giving our famous stained-glass windows a once-over, to minimize the build up of condensation between the windows themselves and the plane glass on their outer side. They're trying some sort of venting system. We'll see! Funniest double-take at prayer today as I looked up and saw...the outside trees instead of stained-glass. Here's the whole south side. Can you spy the one whose window is out? 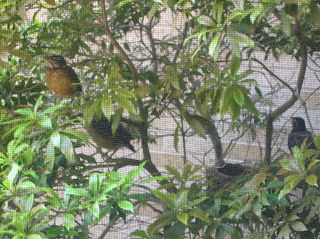 They're hopping around all day, but still spend a great deal of time in their "hatching area," near the nest. Three are in this photo. I've named them: A,B,C,and R. "American, Boy Wonder, Christopher and Rockin'." Great coverage in our local paper for a very sad prayer vigil yesterday for a 14-month old. On my way to Detroit this weekend for American Catholic Council gathering.